Visit Slots.lv Get Your Bonus! Slots.lv Casino is powered by several leading software providers, including Realtime Gaming. Fast, Reliable Withdrawals ? All legitimate, real-money online casinos like Slots.lv have strict anti-fraud screens, and that may create a short withdrawal delay. Join Slots.lv Casino today and get your first deposit matched 200% up to $1,000! ? The bonus applies to your first deposit only. Please read the terms and conditions carefully and make sure to take full advantage of the bonus offer. We assume you are reading this Slots.lv Casino Review because you love slots and casino games. Perhaps the one place you most want to be right now is Las Vegas, and when you saw the name Slots.lv, you thought to yourself, "Even if I can’t make the actual trip to Las Vegas right now, I can play in one of their online casinos". 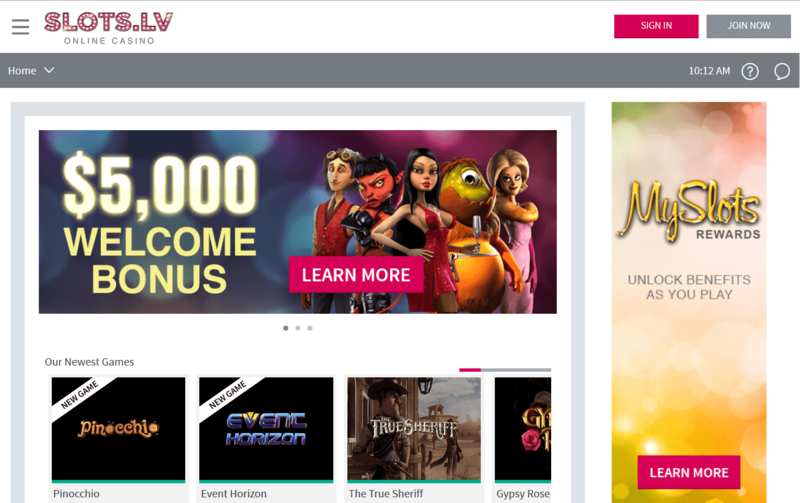 Slots.lv, despite the name, is licensed in Canada, not Las Vegas. But the casino experience is very much like Las Vegas, so in that sense, it is almost like a piece of Las Vegas really is being brought home to you. Slots.lv Casino is relatively new. It has only been in existence since 2013, but during its few years so far online it has quickly established itself as one of the better online casinos open to American players. Canadians are welcome, too, and while many international casinos are also open to Canadian players, some of you might actually prefer Slots.lv since instead of being licensed overseas, it is licensed by the Kahnawake Gaming Commission whose headquarters are in Canada. Slots.lv is distinguished by the fact that its owner-operator, Lynton, Ld., also runs two other highly regarded online casinos, Bovada for U.S. players (established in 2011) and Bodog for international players (operating since 1995). While slots are not the only type of gambling you can do at Slots.lv Casino by any means, the emphasis is definitely on slots as both the wide variety of games and big bonuses specifically for slot play clearly attest. 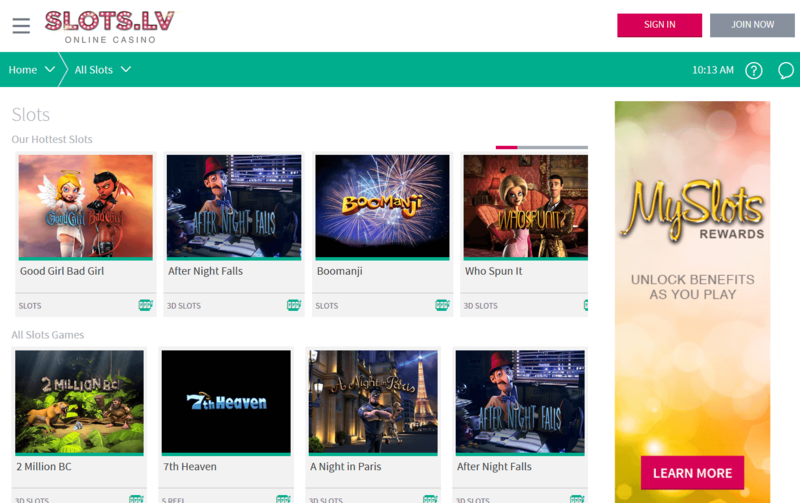 If you love slots, you don’t have to travel to Las Vegas, or even your local casino, to play your favorite games because Slots.lv Casino can bring some of the best slots directly to you on your computer, tablet, or smartphone. While some online casinos rely on a single provider for all of their software needs, Slots.lv Casino has elected to use a combination of several. Among them are Realtime Gaming (the primary software company of choice for casinos catering to American players), Net Entertainment, and Betsoft. We like the idea of using multiple software providers because it is a great way to introduce more variety into the games even if the total number is not that many. Rather than any one company overloading a casino with all of its games (some of which probably should have been left on the chopping block), you get to sample some of the very best from different manufacturers. That translates into a much more enjoyable playing experience for you plus enough variety to keep from being bored no matter how often you play At the same time, the total number of games is not so overwhelming that you are wasting valuable time trying to figure out what to play. We also give high marks in this part of our Slots.lv Casino review for the three-way flexibility you have in accessing the games. Download the software onto your computer. This actually quick and easy process will assure full access to all of the games every time you play. The disadvantage, however, is that you are tied to that computer. Play on any browser in the instant play flash casino. Play on the go on your mobile device. Unfortunately, the Slots.lv mobile apps won’t work with every mobile device on the market, but if you own a current Apple iOS device (iPhone 3 and up or iPad) or Android phone or tablet, you are in luck. While it would be unrealistic to expect an online casino designed for computer use to develop mobile apps that are compatible with every game, some casinos give mobile users so few options that playing on one’s smartphone or tablet will quickly become boring. Slots lv. Casino, on the other hand, gives its mobile players a choice of 31 diverse slots (including some of its most popular ones) plus a representative sample of other casino games: blackjack and Zappit blackjack, European roulette, baccarat, Bonus Deuces Wild video poker, Tri Card Poker, and Double Double Bonus Poker. Some online casinos have less than a hundred games, even in their download version, while others, even by online standards, are tremendous, offering a bewildering choice of over 500 games. In the first instance, it is hard to picture yourself playing in Las Vegas (or any dreamed about gambling destination) rather than sitting in front of a computer, given such a limited game choice. In the second instance, most online players really want to be to able to easily locate and quickly settle down into their game of choice, so having that many games to pick from is probably unnecessary. Besides, if you live in the U.S., none of the mega-sized casinos are open to you. The position we take in this Slots.lv review is that for the average player, a medium-sized casino might work best, and with Slots.lv Casino, home to 240+ games, that is exactly what you get. It is also why our Slots.lv rating in both the Software and Game Selection categories is a very favorable 8 out of 10. Don’t let the attention-getting name fool you that slots are the only game this casino offers; it is a full-service casino. However, slots reign supreme. If you enjoy playing slots a lot, you will surely enjoy playing them a lot at Slots.lv. At Slots.lv Casino, far more often than not, slots are the name of the game. With more than 130 slots to choose from, of every variety imaginable, it is hard for this slots.lv review team to imagine that you will not find at least few games (and probably more than a few) that are perfect for you. If you already have a bunch of favorite slots from previous play, no problem; since all of the slots at this casino are from well-known manufacturers, there is a good chance that you will find those familiar favorites. Or you can take advantage of the opportunity to try a new game that you could wind up liking even more. As soon as you see a game you like, you can open up the tab to learn more about it. Then, if you are still undecided about whether you want to play, no problem. You can select “practice play” to get the feel of the game first and afterwards, if you wish, switch to real money play. If you like to mix up your slot play with other casino games, Slots.lv won’t disappoint you. Most of these games, including video poker, several varieties of blackjack, American and European roulette, baccarat, craps, Caribbean poker, Pai Gow, 3 Card Rummy, Let ‘em Ride, keno, and scratch cards, can be played in either the download or instant play flash version. Or, if you prefer, there are additional gimmick-type blackjack games (Face up, Match Play and Super 21) you can sample just in the download version, along with Perfect Pairs, Pontoon, Caribbean draw poker, Sic Bo, Red Dog, Casino War, and Bonus Bingo. Unfortunately, this casino does not offer any live dealer games, and the limited roulette options (there are many more ways to play this game online) are also disappointing. However, if you play blackjack, Slots.lv Casino gives you the additional option to play single deck, double deck, or European blackjack as well as another interesting twist on the game called Zappit Blackjack. Zappit is a 6-deck game played like regular blackjack but with the additional favorable options of Surrender and splitting pairs (except Aces) up to 3x. But that’s not all: any time you are dealt 15, 15, or 17 as your first two cards, you can hit the zap button to get two new cards! The catch is that even when your final hand is 21 or less, if the dealer busts with exactly 22, the hand counts as a push rather than a win. Zappit Blackjack has become so popular with players that Slots.lv is now offering it for you to play on your iPhone, iPad, or Android device as well as on the computer! Many different criteria enter into our evaluation of a casino, and one area where our Slots.lv Casino rating falls a little short is banking. The problems can be summed up in a few words: limited options for both deposits and withdrawals, especially for players in the U.S., slow withdrawals, and high fees. The various options, which are also listed at the beginning of this Slots.lv review, are repeated below. The good news is that this casino’s average withdrawal processing time of 4-7 business days is somewhat better than at some of the other online casinos that are open to American players. Furthermore, VIP players receive priority banking, faster withdrawals, higher limits, and, in some cases, the casino waives the fee as well. More importantly, all of the casino’s banking practices are for your own protection. Slots.lv uses industry approved advanced encryption technology, thereby ensuring that all of your financial transactions are completely safe and secure. Unless you are brand new to online casino gambling, no one needs to explain to you what the term Welcome Bonus means because practically every reputable online casino today offers one. But that is where the similarity ends. We don’t blame Slots.lv Casino for trying to one-up its competition by offering a bonus that comes across as being bigger and better than any you will find elsewhere. But at the same time, unless you were born yesterday, you know that no casino is going to simply give away thousands of dollars to anyone who signs up agreeing to play without actually seeing evidence of the play it is expecting. In other words, this casino’s Welcome Bonus of up to a whopping $5,000 is great if you are a high roller and can afford the eight deposits (totaling $4,500) and heavy play (over $300,000 in real money) you will need to show to meet the playthrough requirements. If not, you can still take the bonus if you wish, but you will need to scale down. Of course, the bigger the bonus, the more ammunition you have to stay in the game longer in case an initial lucky streak is not in the cards. But rather than blindly accept every fantastic sounding offer a casino dangles in front of you (and that includes daily, weekly, and monthly reload bonuses, too), your best bet is to choose and use your bonuses wisely. Make sure you fully understand all of the terms and conditions before you start playing. This section of our Slots.lv Casino Review should give you a good head start. Play on any other games voids the promotion. Valid on blackjack (except single and double deck blackjack and Zappit blackjack) and video poker. You will note that our Slots.lv Casino rating in the Bonus category is 7/10. The Slots.lv rating in this case reflects the problems we have with the consistently high wagering requirements, staggered bonuses, and encouragement of the mindset that losing one’s deposit is no big deal because another bonus is a quick panacea. The already steep 35x bonus + deposit wagering requirement for the slots bonus jumps to 120x the bonus + deposit for table games. Therefore, we do not recommend taking this bonus. If you wish to play the table games at Slots.lv, your best bet is either to take the Slots Bonus and wait until afterwards to start playing your favorite table games or to forget the bonus. Also, for either of these bonuses, be sure to check with the casino beforehand regarding the maximum time allowed to you both for making each successive deposit and playing it through. It would be a shame to have satisfied the wagering requirements only to learn that you took too long. The good news is that once you meet the wagering requirements for each part of the bonus, that part of the bonus and your associated deposit and winnings are all yours to keep. The $25 bonus is then subject to a 60x playthrough (slots, keno, or scratch cards only) in order to withdraw winnings up to $100. Besides the potentially huge extended Welcome Bonus, it won’t take you long at all to see that Slots.lv Casino is no slouch either when it comes to additional rewards for your continued play. High rollers and non-high rollers alike should be especially pleased once they get their taste of My Slot Rewards, the brand new tiered loyalty program launched in August, 2015. You will find a brief description of that program below as well as a few other special promotions you might want to check out. Every time you play, you earn 1 reward point for every $1 wagered on slots or every $4 wagered on other games. Then, at the start of each month, for every 1,000 points earned the previous month, you earn $1 in cashback. My Slots Rewards is the casino’s new 8-tiered loyalty rewards program. As soon as you make your first real money deposit and start playing, you are in and start at the Depositor Rewards level, which entitles you to receive the above-mentioned cashback along with certain promotional benefits. Thereafter, based on the number of reward points you earned during the preceding month, there are seven additional levels to which you can move up, each offering a correspondingly higher level of rewards. A specified number of points are also required to maintain each of these higher levels. Higher-level players receive offers for bigger and more frequent bonuses, including reload bonuses and weekly cashback bonuses, along with monthly drawings for more bonuses. Starting at the Elite level (requiring 40,000 points), players also get a birthday bonus. VIP status requires a minimum of 100,000 points the previous month plus at least $10,000 in lifetime deposits, followed by VIP Premium, which requires 250,000 points and a minimum of $25,000 in lifetime deposits. Lastly, at the pinnacle is the VIP Exclusive Rewards level, which is by invitation only. On top of everything that lower level players get, all VIP players receive, in addition, higher betting limits, more frequent and much bigger bonuses, and priority banking entitling them to expedited withdrawals and other special privileges. Players at the Exclusive Rewards level also receive their own personal VIP host and more. You can claim a weekly match bonus for each day of the week of up to $100 per day with a deposit $100 or more. See the website for terms and conditions. Sign up to receive emails with a special offer of a match bonus or free chip every Friday. Terms and conditions apply. See the website for details. You don’t have to be a high roller to take advantage of this ongoing promotion. Refer as many friends as you wish by email on Facebook or Twitter. You will receive a free chip equal to your friend’s first deposit up to $200 (amount increased for VIPs). Terms and conditions apply. See the website for details. Join Slots.lv Casino today and get your first deposit matched up to $1,500!